WORTH THE WAIT—If you check foodie guides looking for the most popular restaurants in San Diego, you’ll probably not see Carnitas Snack Shack or Las Cuatro Milpas on the list. 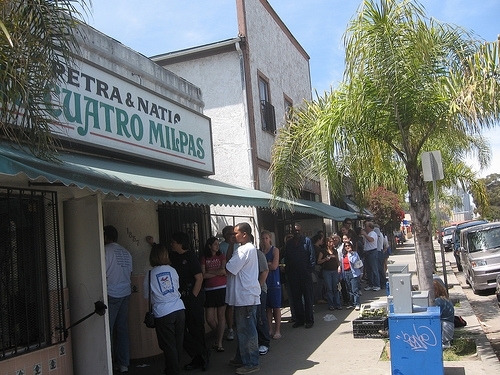 Las Cuatro Milpas has been around (the block) in San Diego’s Barrio Logan neighborhood for a while. Award winning Carnitas Snack Shack is less than a year old after opening in North Park. 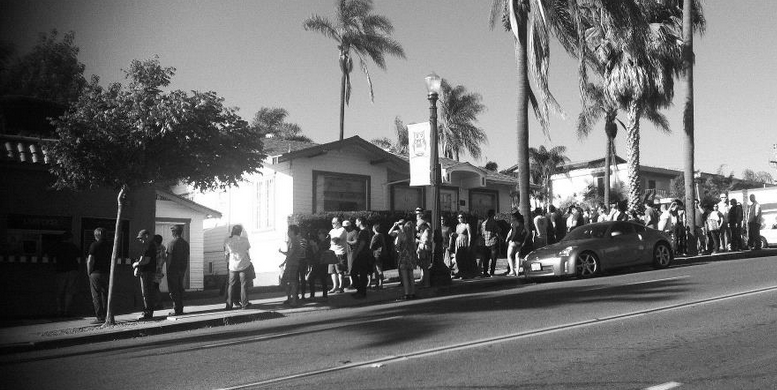 The lines at both restaurants are longer than a jilted prom date’s memory. Las Cuatro Milpas, 1875 Logan Ave., 619-234-4460, is simply excellent Mexican food sold in large portions. Carnitas Snack Shack, 2632 University Avenue, 619-294-7675, is what happens when a highly trained and motivated chef remodels a tiny Mexican take out stand into a gourmet experience. Blockbuster sales and lines around the block has forced a remodel to provide limited seating. Stylish as it is, it is still a tiny take out. Who cares? Bring a plastic garden chair since it’s muy rude to cut in line. NEWS: San Diego Architectural Foundation held its yearly Orchids and Onions Awards last week. Carnitas Snack Shack was up for a design award this year. Alas, the judges gave a couple of beach toilets top awards and ignored the much better looking Carnitas Snack Shack. Not winning probably doesn’t phase Chef Hanis Cavin and partner Sara Stroud because they’re the hottest tick in town. Their new restaurant concept has totally revitalized a dumpy take-out stand, and provided design style on top of gourmet farm-to-table food at an affordable prices. The new Carnitas Snack Shack was designed by architect Jared Bradley, who reinvented the old Vo’s Cafe as a modern outdoor dining experience. No stranger to the neighborhood, Bradley had previously designed the brilliant Linkery restaurant, also in North Park.